Bill Edwards Presents, Inc. | Celebrate St. Pete: Set the TV to ‘America’s Got Talent’! 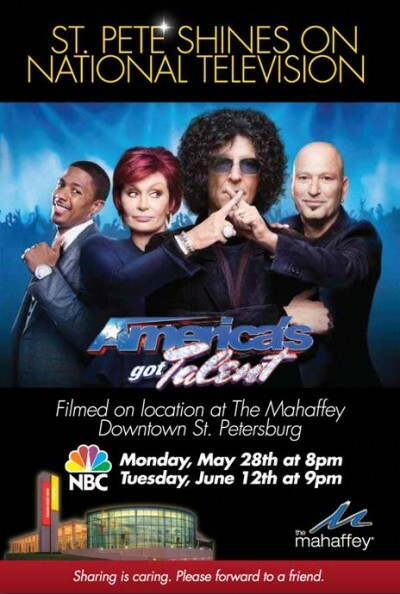 Celebrate St. Pete: Set the TV to ‘America’s Got Talent’! Home / Celebrate St. Pete: Set the TV to ‘America’s Got Talent’! ST. PETERSBURG, Fla. (May 21, 2012) – Be sure to watch later this month as The Mahaffey, St. Petersburg’s crown jewel, makes its national debut on the NBC hit summer television series, America’s Got Talent! The show will air in two parts – Monday, May 28 (Memorial Day), 8 p.m. and Tuesday, June 12, 9 p.m.
Howie Mandel, Sharon Osbourne, Howard Stern and host, Nick Cannon sailed into town to tape the two-part show at the newly renovated theater in April, as thousands of the Bay area’s residents seized the chance to be a part of the studio audience. With more than 20 million viewers tuning in for the show’s premier week on May 14-15, America’s Got Talent can help brand St. Pete as Florida’s entertainment destination. The seventh season of NBC’s hit talent competition will showcase diverse talent from across the nation, as well as the natural beauty of some of America’s best towns and cities. The Mahaffey’s management team pushed for NBC’s America’s Got Talent to tape at the theater for the opportunity to demonstrate the beauty of the city on a national scale. When viewers tune in, they’ll see a magnificent overhead shot of The Mahaffey as a camera pans the beautiful waterways of Tampa Bay. The show’s producers captured the best of the bay while filming at St. Petersburg’ performing arts gem. Show community pride this MEMORIAL DAY, and tune in to catch the best amateur performers on television, some of which hail from the region. Being featured on the hit show will put a spotlight on the area and help further the city’s national presence, essentially creating a platform for future endeavors. The Mahaffey, now under the management of Big3 Entertainment, is one of Tampa Bay’s top-rated performance arts venues. Home to the Florida Orchestra, The Mahaffey hosts top-quality national and international artists and performances – Broadway, pop, rock, comedy, dance, classical and interactive engagements and exhibitions. Located in the heart of downtown St. Petersburg, the 2,031 seat cultural jewel boasts spectacular waterfront views and is located only minutes away from white sandy beaches and world-renown museums. Additionally, the theater supports the highly successful Class Acts program, which enables school children to experience the performing arts through in-theater performances as well as in-school outreach and extension programs.